When journalism students visit our offices at WITNESS to learn about video and human rights advocacy, the most common questions we hear are on the ethics of using eyewitness footage: How do you verify a video you find online? How do you know if a video is “verified” and if you can use it in your story? When and how would you use videos made by terrorist groups in a report? As a human rights organization dedicated to using video as a tool for advocacy, these are questions we and our partners wrestle with every day. Increasingly, video documenting human rights abuse is filmed not by professionals but by average bystanders who have never been trained on issues like informed consent or by organizations aiming to spark fear or groups attempting to spread misinformation. When such videos surface as part of a news story or a human rights investigation, what is a journalist or advocate to do with them? How do we apply the traditional codes of ethics when using footage we ourselves did not produce (often described as “user-generated content,” “UGC” or “citizen video”)? It’s not surprising these questions are what young professionals want to talk about. Eyewitness videos are not only a central part of news reporting today, but a common element in social media channels. 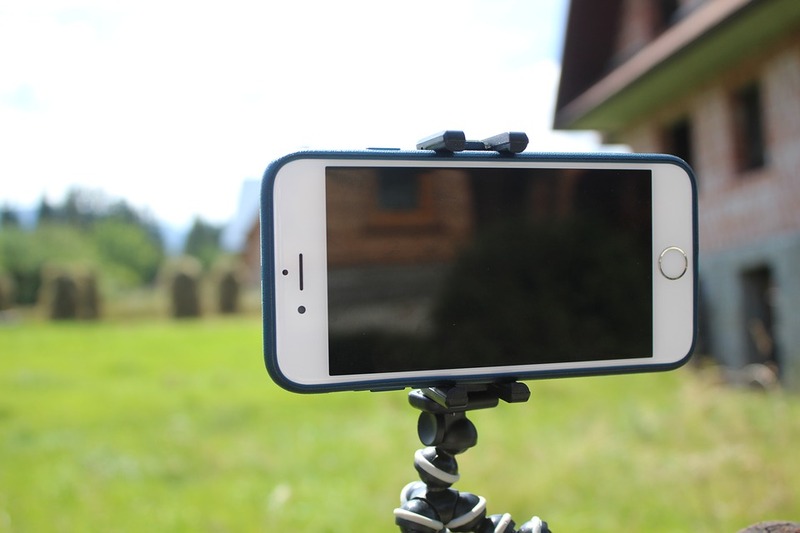 Addressing the ethics of using eyewitness footage provides students with a lesson that is immediately relevant to their own practices as consumers, creators and curators of information. Yet, guidance on the ethics of using eyewitness footage hasn’t caught up with its importance as a reporting tool. 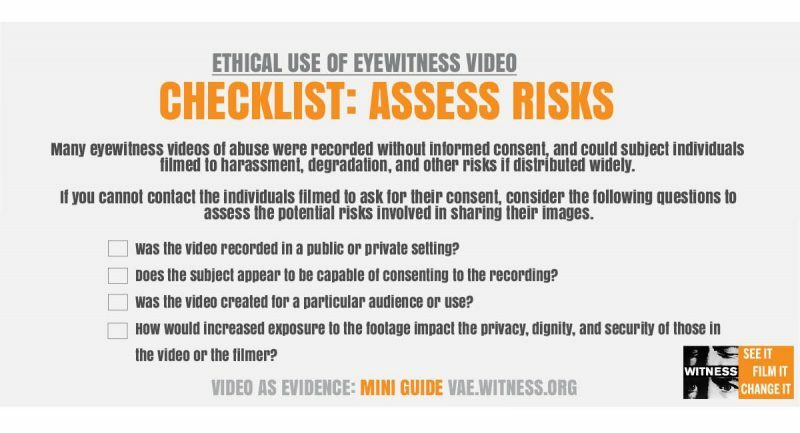 WITNESS’s Ethical Guidelines for using Eyewitness Videos in Human Rights Reporting and Advocacy was created to begin to fill that gap. 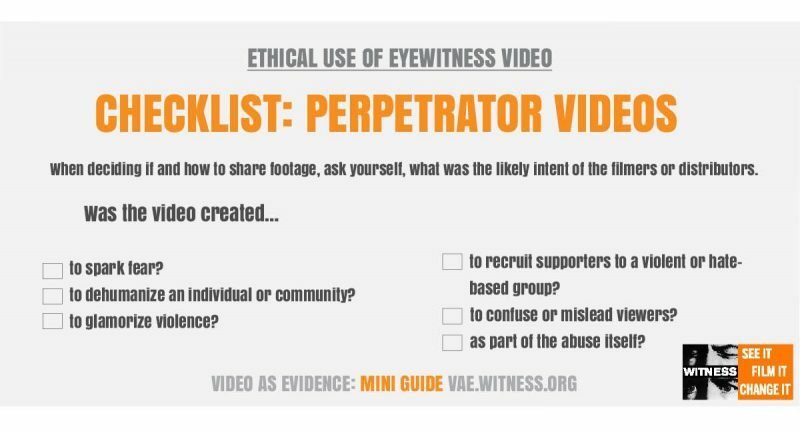 WITNESS’ guidelines were written to help reporters, producers and advocates think through who could be affected by sharing eyewitness footage, and how to minimize potential harm to those people. After all, ethical mishaps are often the result of a lack of information. 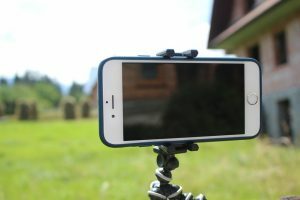 In the case of eyewitness footage, many reporters or producers simply don’t know what questions to ask about the footage and haven’t had a chance to consider the potential consequences of sharing it with a wider audience. How could they be potentially harmed by the footage? How could you as a journalist minimize potential harm? You might be asking, why “stakeholders”? Why not just “filmers”? Or “subjects”? When using eyewitness footage, there are a number of different people who could be affected by its distribution. First of all, there are those on camera. You don’t necessarily know if they consented to being filmed or even knew that they were on camera. Finding themselves on the evening news could change their lives forever. Depending on the nature of the footage, it could put them at risk of humiliation, harassment or worse. Other stakeholders include those who filmed the footage and those who shared it. (Often this is the same person, but it could be different people with distinct objectives). Did they realize they were sharing it publicly? Could the footage put them at risk due to the nature of the footage? Are they aware of the consequences of attaching their identity to the footage, and did they take steps to protect their identity (such as sharing it on a new YouTube account without their name on it)? If someone uploaded a video to their Facebook page, they may only expect their circle of friends to see it. We’ve seen several headline news cases involving eyewitness footage in which the filmer later expressed regret for associating their name with the footage (such as the bystander who filmed the chokehold death of Eric Garner in Staten Island). The safety of those who provide newsworthy footage is critical for journalists to consider. Finally, stakeholders include the audience. What are the potential consequences of sharing footage that may turn out to have been disseminated as part of a misinformation campaign or a hate group? What sort of footage would warrant a warning to viewers about its graphic nature? How can a journalist share footage responsibly when it has not been independently verified? Our ethical guidelines don’t provide answers to these scenarios, but rather sets of questions to help reporters identify and address ethical challenges that can easily fall through the cracks. 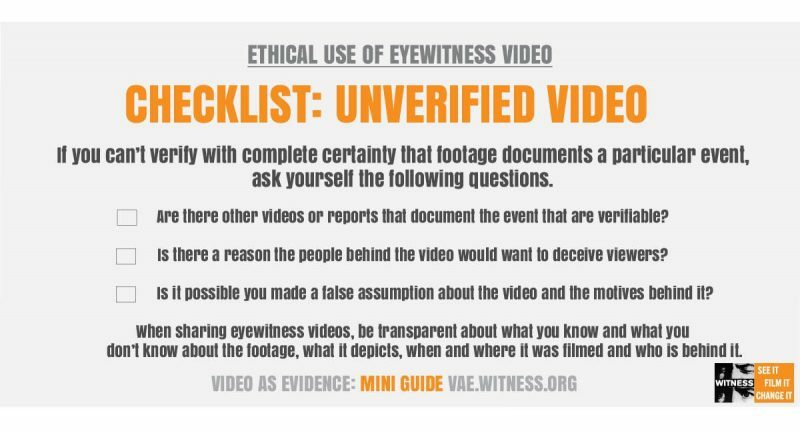 In your classroom, you can find an example from the week’s news, from your community or from a class project, and use these checklists as a starting point for a discussion on the ethics of reporting with eyewitness footage. If you are searching for examples for discussion, you can find several from around the world in WITNESS’ Ethical Guidelines. The Eyewitness Media Hub’s Medium channel is another great source of case studies illustrating how eyewitness footage used in the media inadvertently affected the people behind the footage. For much more on the ethics of using eyewitness footage in reporting, check out our blog series tackling a different aspect of the topic each week. The Eyewitness Media Hub, First Draft News and the ONA’s Build Your Own Ethics Code are other fantastic resources for guidance, tools and case studies on using eyewitness videos in reporting. How do you discuss the ethics of using eyewitness video to journalism students, and what has been particularly challenging or successful? What resources would you recommend? We look forward to hearing from your experience in the comments below. Madeleine Bair leads the WITNESS Media Lab at WITNESS where she examines how eyewitness video can be used safely, ethically, and effectively for human rights reporting and advocacy. Follow her on Twitter @madbair and follow WITNESS at @WITNESSorg. WITNESS Program Coordinator Sarah Kerr also contributed to this post.